Groundwater hydrology is a mature research field. The idea of discovering a new type of groundwater system seems unlikely. Yet, in the floodplains of the River Murray system, freshwater lenses float on saline groundwater under conditions that seem, on first impression, counterintuitive and unfavorable for the persistence of fresh groundwater. Most of the world’s groundwater is saline. Saline groundwater may derive from various sources, including through the intrusion of seawater, dissolution of subsurface minerals, evapo-concentration of infiltrated rainfall, and human activities (e.g., agriculture, mining, etc.). Saline groundwater is common in shallow aquifers of semi-arid and arid settings, where strong evapotranspiration may concentrate salts transported to the subsurface through rainfall infiltration. For example, in the Murray Basin (Australia), this has led to groundwater salinities up to twice that of seawater. Much of the saline groundwater of the Murray Basin flows towards the River Murray and its adjoining floodplains. The River Murray is part of the Murray-Darling Basin, which is the largest and most heavily exploited river system in Australia and is the lifeblood of extensive ecosystems that occur within the semi-arid climates of its lower reaches. The management of saline groundwater discharge to the River is the focus of significant engineering works, in the form of the large-scale “salt interception scheme” (MDBA, 2010). The intent of the scheme is to maintain the river salinity below thresholds that would otherwise impact drinking water quality, cropping and ecosystem function. Reductions in the frequency and magnitude of flooding have led to vegetation dieback in the River Murray floodplains (DEH, 2005). Investigations into the factors impacting floodplain vegetation and river salinization led to the discovery of freshwater in otherwise saline floodplain aquifers (e.g., Weaver, 2009). The occurrence of freshwater in saline River Murray floodplains was attributed to various causes, most commonly the infiltration of floodwaters, but also, groundwater levels in floodplains were lower than the river water level in some locations, creating losing-river conditions and extensive freshwater lenses (e.g., Cartwright et al., 2010). Freshwater in saline aquifers adjacent to ‘gaining’ rivers (i.e., the groundwater level exceeds the river water level) have previously been attributed to transient effects, including flood recharge and localized bank storage (e.g., Weaver, 2009; AWE, 2012). This is because the notion that freshwater lenses may persist in floodplain aquifers adjacent to gaining rivers appears to defy the forces acting at the river-aquifer interface. That is, if the river is gaining saltwater, both hydraulic and water density forces, i.e., due to the higher groundwater level and greater groundwater density, act towards the river. Or, in other words, there appears no way for freshwater to “migrate upstream” against the flow of heavier groundwater towards the stream. The occurrence of buoyant freshwater lenses in the riparian zones of gaining rivers was first explored using the theories for freshwater-saltwater interaction that are routinely applied to coastal aquifer situations. The simplified conceptual model displayed in Figure 1 was tested. The classic approach of Du Commun (1828) (i.e., the so-called Ghyben-Herzberg equation) was adapted to determine whether buoyancy forces might allow freshwater lenses to float above the flowing saltwater, adjacent to the river. On the basis of physical laws of conservation of mass and energy, and Darcy’s Law for groundwater flow, Werner and Laattoe (2016) showed that riparian freshwater lenses were plausible, and analytical solutions were developed to predict the extent of lenses and their influence on the rate of saltwater discharge to the river. The new theory also proved to be a useful screening tool for an initial determination of whether a freshwater lens will occur in floodplain aquifers. Lens length estimates from the new analytical solution were roughly consistent with previous River Murray floodplain geophysical surveys that revealed near-river freshwater bodies. Figure 1. A conceptual model of a stable, buoyant freshwater lens adjacent to a gaining river. The lens length (xL) and saltwater discharge rate (qs) is related to river and aquifer geometric and hydraulic properties (adapted from Werner and Laattoe, 2016). Werner et al. (2016) validated Werner and Laattoe’s (2016) theory for buoyant riparian freshwater lenses using sand-tank experimentation. A schematic of the setup is given in Figure 2. Figure 2. Experimental setup for testing whether freshwater lenses will form adjacent to a gaining river in a saline aquifer. The “river” is simulated by the left-hand reservoir, whereas saline groundwater flow towards the river is simulated by the right-hand reservoir (taken from Werner et al., 2016). A series of sand tank experiments were undertaken using various reservoir water levels. Freshwater lenses created under laboratory conditions were closely matched to the lenses predicted by the analytical solution of Werner and Laattoe (2016), as shown in the example given in Figure 3. Small discrepancies between the analytical solution and sand-tank results indicated that dispersion effects were non-negligible. Subsequently, Werner (2017) developed a correction to the Werner and Laattoe (2016) analytical solution so that an empirical factor could be applied to account for dispersive effects. Figure 3. Example of sand tank experimental results of Werner et al. (2016), representing a gaining river in a saline aquifer. The stable freshwater lens (sand colour) is floating in otherwise saline groundwater (red-stained). 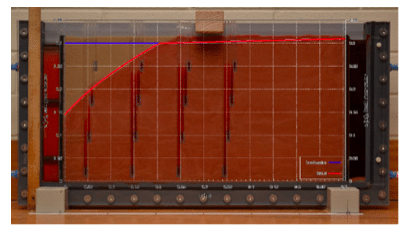 The analytical solution of Werner and Laattoe (2016) is given at the red line, and the lens watertable is shown as the blue line. The buoyant riparian freshwater lenses discovered by Werner and Laattoe (2016) and reproduced under laboratory conditions by Werner et al. (2016) add to the currently known forms of groundwater flow systems. The plausibility of these lenses means that interpretations of river-groundwater interaction on the basis of salinity measurements in floodplains need to be reconsidered. Fresh groundwater in saline aquifers near rivers does not necessarily imply that floodwater recharge has occurred, or that the river is losing. Future work should focus on characterizing these systems under natural conditions. 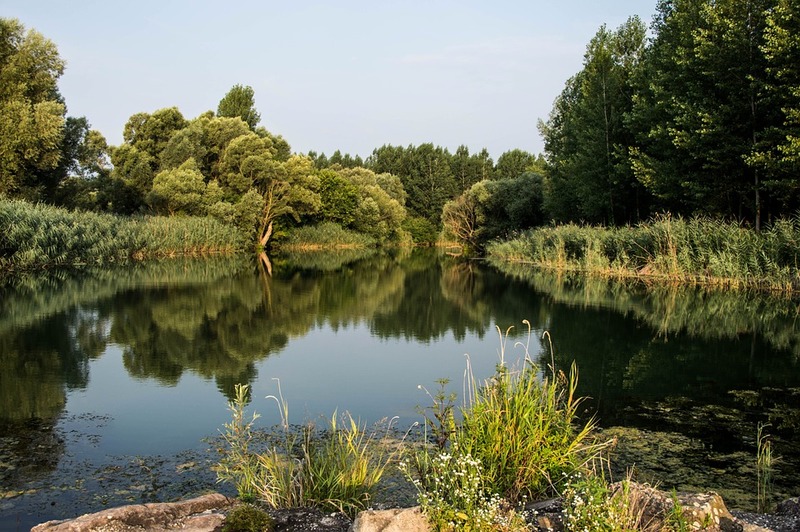 Further research is also warranted to determine the formation mechanisms and fragility of these lenses, because they may support riparian vegetation through the provision of freshwater in otherwise highly saline conditions. These findings are described in the article Correction factor to account for dispersion in sharp-interface models of terrestrial freshwater lenses and active seawater intrusion, recently published in the journal Advances in Water Resources as well as Werner and Laattoe (2016) and Werner et al. (2016), published in Water Resources Research. This work was conducted by Adrian Werner from Flinders University. Cartwright, I., Weaver, T.R., Simmons, C.T., Fifield, L.K., Lawrence, C.R., Chisari, R., Varley, S., 2010. 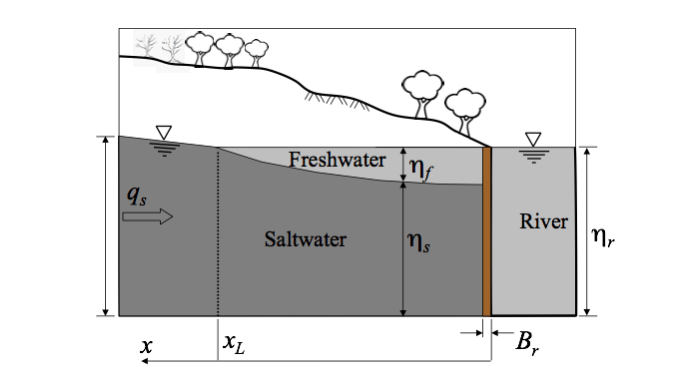 Physical hydrogeology and environmental isotopes to constrain the age, origins, and stability of a low-salinity groundwater lens formed by periodic river recharge: Murray Basin, Australia, Journal of Hydrology 380: 203–221. DEH, 2005. Dieback in native vegetation in the South Australian Murray-Darling Basin: A guide to causes and symptoms, Department for Environment and Heritage, Government of South Australia, ISBN: 1921018371. Du Commun, J., 1828. On the cause of fresh water springs, fountains, etc., The American Journal of Science and Arts, Vol. XIV, Art. XXV, New Haven. MDBA, 2010. Keeping salt out of the Murray. Murray-Darling Basin Authority, Canberra, https://www.mdba.gov.au/sites/default/files/pubs/MDBA-14165-Brochure-WEB-FA.pdf. MDBA, 2012. River Murray floodplain salt mobilisation and salinity exceedances at Morgan, Murray-Darling Basin Authority, Publication No. 53/12, Canberra. Weaver, 2009. Sustainability of freshwater lenses under major rivers, Land and Water Australia, Report PN30169, www.lwa.gov.au/node/2998. Werner, A.D., 2017. Correction factor to account for dispersion in sharp-interface models of terrestrial freshwater lenses and active seawater intrusion, Advances in Water Resources 102: 45-52. Werner, A.D., Kawachi, A., Laattoe, T., 2016. Plausibility of freshwater lenses adjacent to gaining rivers: Validation by laboratory experimentation, Water Resources Research 52(11): 8487-8499. Werner, A.D., Laattoe, T., 2016. Terrestrial freshwater lenses in stable riverine settings: Occurrence and controlling factors, Water Resources Research 52(5): 3654-3662. Adrian Werner is a Professor of Hydrogeology at Flinders University. After completing a Civil Engineering Degree at Central Queensland University in 1992, he worked for the Queensland State Government until 2006 on water resources projects, specialising in surface and subsurface hydrology. Adrian completed a Ph.D. at the University of Queensland in 2004 on the topic of coastal aquifer hydrodynamics, and holds Associate Editor positions with the Journal of Hydrology (since 2007) and Advances in Water Resources (since 2012). Adrian is an active member of the National Centre for Groundwater Research and Training.